Snow was forecast in Rhode Island for the First Day of Spring two weeks ago, so Charley and I decided to go in search of sun and flowers. Needless to say, Roxie was not pleased. We flew to Walt Disney World in Florida to spend some time at the International Flower and Garden Festival at EPCOT. Charley loves Disney World. It brings out the kid in him (as if he needed any motivation). And I love flowers and gardens. We took photos of all the topiaries. I got some great ideas for my box woods that have survived the last few winters in New England. It’s been said that I’m a lethal pruner so, now I just need to get some control and develop the creative ability to subtly sculpt (and know when to stop). All around the park were small theme gardens: Butterfly & Purple Martin Habitats; spicy, hot Moroccan Seasonings; Tuscan Herbs; Prehistoric Plants; English Tea Gardens; Plants for Health & Healing ; Bonsai; Orchids, Alpine Containers and many more.There was so much to learn and we went from site to site soaking up all of the information presented. Disney offers some special Behind the Scenes Tours and we’ve been on a few. Charley’s favorite is the Christmas one. These tend to take a few hours and reservations need to be made in advance. Charley arranged for us to take an hour tour at The Land to explore the varieties of hydroponic methods used in their greenhouses. Hydroponic means growing plants using water instead of soil. Nutrients are added into the water to create growing solutions. Some of those nutrients come from tilapia waste products. They raise the tilapia (a local fish) in tanks in one of their greenhouses. The 60 different types of plants grown in the greenhouses provide food for their restaurants, and landscape plants for their gardens, promoting the idea of sustainability. It’s Sunday and we’re back in Rhode Island. The cats are still sulking and trying to make us feel guilty about abandoning them. Yesterday, I put out the hummingbird feeders (with extra sugar) for the early birds. It snowed again last night. In April, the snow melts quickly, so, at least we won’t be shoveling. Still, maybe we should have extended our vacation for another week? You can Download the My Disney Experience Ap or visit MyDisneyExperience.com for more information. The EPCOT International Flower and Garden Show runs until May 30, 2016. on weekends there is a concert series and you can also attend garden presentations and meet with horticultural and outdoor specialists. Wow, those sculpted bushes would take a little time! I thought you might like this post, as you are a fellow Disney enthusiast! They do all this work at night when the park is closed! Can you imagine how many gardeners they employ? I can’t even imagine, but anything is possible with enough pixie dust! Wonder if I could get a job! Charley wants to move there and be the Mayor of Reedy Creek (the town that Disney is in). I’m not sure what I’d do – probably garden or take care of the animals at Animal Kingdom. Thank you, Mukul. I thought I send some sunshine out to those who are longing for summer. Welcome. We saw a blistering day yesterday in Delhi, the Sun scorched us at 43C. So please hold the Sun and Summers are not sought after here. Just being warm sounds pretty wonderful. We are in another cold snap this week. Sigh! The pictures are wonderful. I had a fire in our fireplace while I worked on the post. Yes, the sunshine felt great on my pale skin. My nose got burned! The colors actually were almost too stimulating! Hi, Terry. I love your photo. Very handsome! We spent a little time at Disney but then traveled to Tampa and St. Pete. Where were you and Gary? We flew into Orlando, and spent the week in Vero Beach. We had a wonderful time, what were you doing in Tampa and St. Pete.? Going to Grapefruit Baseball League games, visiting a friend, seeing a play at American Theatre, going to a bird sanctuary in Tampa, eating al fresco in St. Pete and attempting to continue editing my mystery! Never been to Vero Beach. Glad you had fun and caught some rays. Wow, you stayed very busy. I am sure Roxie is glad you are back. She has become very clingy and I’ll probably end up tripping over her and breaking my neck! I think the sunshine gave us the boost we needed to run around and have fun outdoors. It opens at the beginning of March and goes through to the end of May. The weekends are the times when they have workshops, concerts and speakers. Do you like baseball? We took in some grapefruit league games and I’ll write about that next time. Thank you for sharing the fun and gorgeous photos as well as updates on your trip, etc! The colors were spectacular. I had to take my photos and share. We actually went to Florida to catch some early baseball. I’ll probably write about that next time. (For the second part of our trip we visited a friend in Tampa with no internet, so I was forced to stay away from social media, therefore, no blog, twitter or Facebook.) But I did spend some time editing the mystery. And still there is much more to do! Hope all is well with your newest publication projects! I love Epcot Center. One of my favorite places to visit. It’s like a trip around the world without having to hop on a plane. We spent the day there and ate at the French Restaurant. Very Adult Disney! I learn something new every time we visit. So beautiful. A nice escape from our snowy morning! Yes, and how are you two doing? Hopefully acclimating well. The summer will be so much nicer, I promise. We’re doing good and made it through the winter! Still counting down to warmer days though 🙂 Can’t wait for beach weather. Just wait until you see the tourist crowds! Beaches for the locals on this side of the bridge are in late Spring and Autumn. Oooooo yuck! Yeah, we might not be heading to the beaches on the coast line but we found some local beaches we can get access to. Think we’ll be taking that route. Plus, we can bring the dog. Fingers crossed those beaches won’t be bad! Good plan! Hope to see you some day soon. We went behind the scenes to see how they decorated the trees and did the flower arrangements and went to the warehouse where all of the thousands of ornaments, and holiday paraphernalia are stored. Of course we also did Mickey’s Christmas Party. And at each country in EPCOT, there is a Santa or their version of Father Christmas and a play is staged about the traditions of that country. And the concert in the evening is phenomenal. It is fun and we turn into big kids! What fun! I love the very first pic of all the spring flowers. You really will have to invent a way for the cats to go with you next time. We have fantasised about dressing the dog up and putting him in a stroller like I used to when I was a kid – now there’s an idea! I wonder if Roxie would suffer the humiliation. She refuses to wear a flea collar, so a coat is out of the question. But she does like to jump in the suitcase while we’re packing, so, there’s a thought????? We’re expecting another spring snowstorm tomorrow. I’ll have to keep looking at the Florida flowers on my blog and dreaming of sunlight! Ha ha. Its all in the mind. I’m dreaming of cooler days and gentler light. I suspect you may have issues when you want to close the case. Let’s hope it never comes to that! Ethel!! I can’t believe you were so close to me and didn’t call me! I live about 35 min from Disney, as the crow flies, about 2 hrs on I-4!! My second grand was born an hour ago, I’m so twitterpated, I can’t sleep!! Oh, Lucy! First a Huge Congratulations! How exciting. No wonder you can’t sleep. I need info! Name? weight? boy? girl? everything!!! What amazing gardens! Surely photos of Minnie and Mickey would have interested the cats…? Roxie was so furious about our leaving her again, , she would definitely want to eat them and ZuZu only likes eating bugs. We didn’t get a chance to go to Animal Kingdom to see It’s a Bug’s Life – but she would have liked that, I’m sure. (The Disney gardeners work through the night to make sure everything is always perfect in the day time for visitors.) We didn’t get a chance to attend any workshops, but they are all free and are on the weekends. And today, here in Rhode Island, it is snowing and all of my lovely daffodils have their golden heads buried in drifts of white. We left Florida much too early and left the sunshine behind us. You’re very welcome. The annual garden show runs from March to the end of May. i think the grandkids might really like the Halloween Spectacular or Christmas time at Disney. One of my favorite times is the Food and Wine Festival! 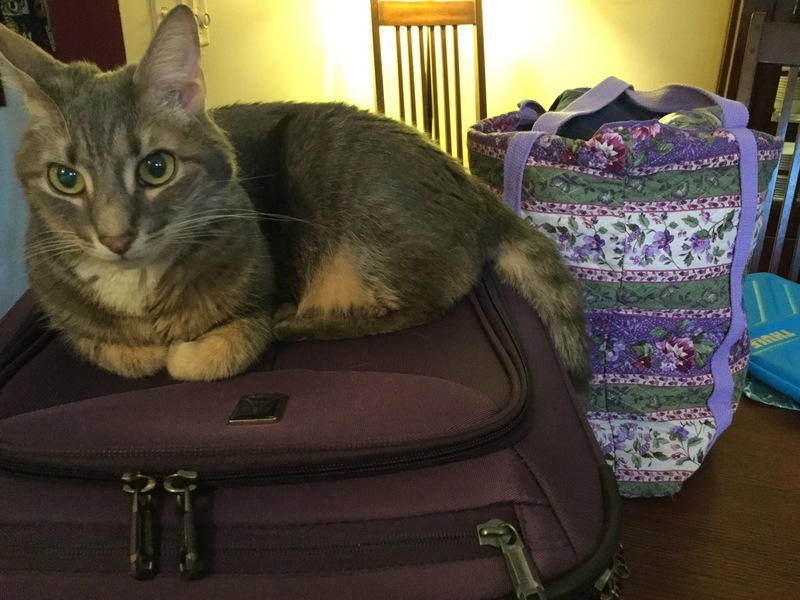 Roxie usually climbs inside the suitcases when we bring them out. She knows exactly what that means as you can tell on her face in the picture. Yes, when I was little, I wanted a pet so badly. i sleep with tons of stuffed animals – no dolls. The first thing I did when I bought my own house was to get a dog and cat. Great post and fantastic pics. Charley and I were just talking about a trip to Scotland. I’ve been a few times in the summer season. He loves to golf and we were trying to decide the best weather there for golfing. Wishing you sunshine when you get home. Everybody around here is none too happy with us. They are blaming us for bringing the snow and sleet we are now experiencing here in the North East. Once upon a time I’d have said May was the best month to come but the weather has changed so much it’s impossible to predict. Last year, May was dreadful. It rained all month. Maybe September. Whenever you do decide to come to Scotland do let me know – would be great to meet up. The flower and garden show sounds – and looks – amazing! Glad you had a good time. However it would appear that someone forgot to tell Massachusetts it’s now Spring! I know – is this crazy? People are blaming us for bringing the snow back with us from Florida! What a delightful post! Love the photos and slideshow! Yes–your cats do appear to be “shunning” you—LOL. That is WHY I do not have any pets—I am on the go too much…I think people are lucky who have them, but I do not think I would even know how to take care of one! I have friends who have cats as pets–and cats seem very temperamental to me. Nice that you and Charley could enjoy some Spring warmth! If it is any consolation—it snowed here in Wisconsin two days ago…and it has been COLD for the last week…a WINTER cold! Best to you and Charley! Happy Spring! Thank you. The forecast is supposed to improve over the next week, but it’s still much colder than Florida. I agree, it isn’t half as cold as Wisconsin- no consolation, though! I love having cats around the house.They’re cuddly and easy. I’d have a dog, but we still travel too much. Maybe later on in life? Wow hmm the lethal pruner?! I was ruthless with Rose Bushes! hahaha I am as well! Yes, I’m familiar with those sharp, pointy knives you use with such abandon for your dicing! 🙂 hope all is well dear! You are doing so well. You’ve already written the separate stories, so you just have to put them in order and edit. And then the fun….adding in photos and recipes – your forte! Take your time! You’re young! It’s Autumn here, but … yesterday it was 34 degrees Celsius- around 100 Fahrenheit. I doubt that winter (and rain) will ever happen. Oh for some snow, or even some cold. Fascinating post. I’m glad Disney is actively working towards sustainability. I really dislike the sculptures! sorry! Please don’t make anything similar in your garden. Let plants be beautiful in their own right. What a great idea for escaping the bad weather. Your photos from Florida make me feel so jealous. Such beautiful flowers and shrubs.I can’t say I’ve ever wanted to go the Disneyland, but your photos of the cartoon characters among all the spring colour are a delight. I hope your weather in Rhode Island soon improves. We’re just having our usual mix of rain and sun, with plenty of wind! One day the temperature actually reached 20C, so it felt positively tropical. Charley is a big kid and he really loves Disney World in Florida. There are many things for adults to do. Great Behind the Scenes Tours and restaurants and spas. EPCOT is a true educational treasure trove. What a gorgeous post. I loved seeing the pictures of the flowers and topiary. Good luck with shaping them in your garden. It will all grow back if you prune too much. If I were doing it, I would go for a free form look rather than a specific form. Loved the Christmas trees/celebrations from different countries. I was in south Florida recently but did not make it up to Disney World. Went to the Keys instead. Lovely post with your lovely personality shining through! Thanks, Lori, Charley and I have talked about going to the Keys on a future visit to Florida. I’m not sure what we’ll do when we get there, as I’m not a swimmer nor a snorkeler. I guess I’ll go in search of Hemingway’s cats? My friend Kate from Australia read the post and she agrees with you. She said I should leave things in their normal state, so I guess I won’t be doing topiaries any time soon. I pruned back the bushes last fall, so hopefully the buds that were not killed by the latest freeze will produce lots of flowers. I’m better organized this week and will be posting today or tomorrow.